Mumbai Indians 8-166 (Aditya Tare 59, Glenn Maxwell 23, Shane Watson 2-30) beat Rajasthan Royals 7-152 (Brad Hodge 39, Stuart Binny 37*, Dhawal Kulkarni 2-21) by 14 runs. 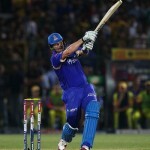 Mumbai Indians blasted 166 runs for the loss of 8 wickets in the measured 20 overs and Rajastahn Royals scored 7-152. Aditya Tare (Mumbai Indians) was announced ‘Player of the match’ for his brilliant 59. The 66th match of the Indian Premier League was played on Wednesday, may 15, 2013, at Wankhede Stadium, Mumbai. Earlier, the skipper of Rajasthan Royals, Rahul Dravid, won the toss and elected to field first. Glenn Maxwell and Aditya Tare started the innings for the hosts aggressively as the first dispatched 3 sixes in the opening three overs. Maxwell was unable to continue and was declared leg before wicket off Shane Watson for 23 as Dinesh Karthik walked in next. Tare hit 1 six and 5 fours in the following over as Karthik added 2 fours until the end of the 10th over. Aditya Tare attained his maiden fifty of the IPL 2013, in the next over with a couple of fours and the partnership for the second wicket was extended to 101 in 11.5 overs. Karthik lost his wicket at that point for 21 and was replaced by the Mumbai Indians captain, Rohit Sharma. Tare was caught by Shane Watson off Kevon Cooper for 59 from 37 balls with 1 six and 8 fours after the addition of seven runs to the total. Kieron Pollard appeared in the center next and the 14th over witnessed 14 runs with 1 four and 1 six. Rohit Sharma was gone at 138 in 15.5 overs at his personal feat of 14. Pollard was run out for 17 and Harbhajan Singh was the only other batsman who entered the double figures by scoring 15. The home side amassed 166 runs with two wickets remaining at the end of the 20th over. James Faulkner and Shane Watson were the top wicket takers with two wickets each whereas Pravin Tambe and Kevon Cooper shared one wicket each. 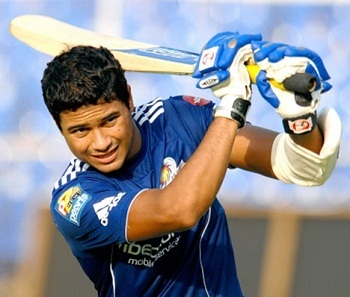 Rajasthan Royals were in trouble from the word go as three of their top order batsmen surrendered at a nominal score. Rahul Dravid, Ajinkya Rahane and Sanju Samson were sent back to the pavilion at just four runs each. The visitors were reeling at 4-28 when Shane Watson and Stuart Binny joined in together and the first hit 2 back to back sixes in the 8th over. Watson became the fifth victim for 19 as Dishant Yagnik arrived in the park as Binny gathered 11 runs in the 12th over with 1 six and 1 four. The stumps of Yagnik were broken by Harbhajan Singh for 10 as Brad Hodge associated with Stuart Binny. The tempo of scoring was enhanced instantly by the two batsmen as Hodge punished Pragyan Ojha for 4 fours in the 16th over and he added another 2 boundaries in the coming overs. Brad Hodge was held lbw off Lasith Malinga for 39 off 27 deliveries with 7 fours and the task became difficult for Rajasthan Royals. Stuart Binny remained unbeaten for 37 off 29 with 1 six and 3 fours as the tourists scored 152 after losing seven wickets in the required overs. Mitchell Johnson and Dhawal Kulkarni were the chief wicket takers with two wickets each whereas Harbhajan Singh, Lasith Malinga and Pragyan Ojha claimed one wicket each. Mumbai Indians triumphed in the interesting battle by a margin of 14 runs, got two points and touched the top spot on the table. The present standing of the two teams in the tournament is as follows. Rajasthan Royals – 20 points from 15 games – 3rd position.